Shahriar, M., Hatami, B., Eghbalsaied, S., Jalaliezand, A. (2014). A Survy on Deletion and Insertions Presented in MRJP3 (Major Royal Jelly Protein 3) Gene in Isfahan Persian Hony Bee (Apis Mellifera Meda). International Journal of Advanced Biological and Biomedical Research, 2(Issue 4 (2)), 57-70. Maryam Shahriar; Bijan Hatami; Shaahin Eghbalsaied; Alireza Jalaliezand. "A Survy on Deletion and Insertions Presented in MRJP3 (Major Royal Jelly Protein 3) Gene in Isfahan Persian Hony Bee (Apis Mellifera Meda)". 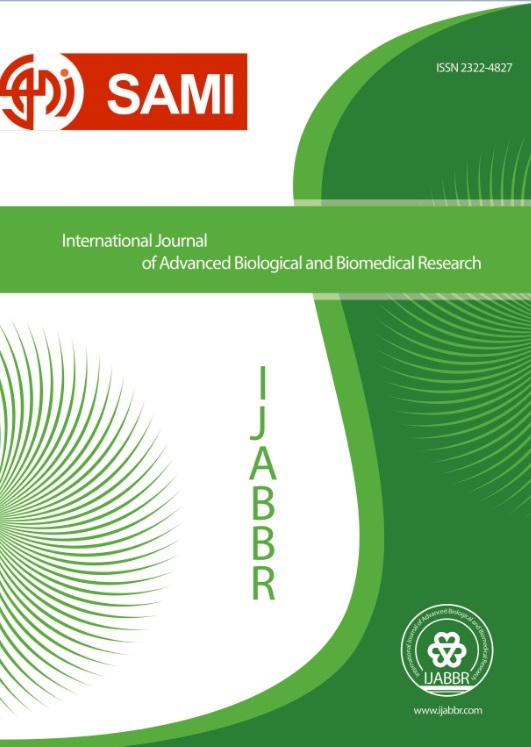 International Journal of Advanced Biological and Biomedical Research, 2, Issue 4 (2), 2014, 57-70. Shahriar, M., Hatami, B., Eghbalsaied, S., Jalaliezand, A. (2014). 'A Survy on Deletion and Insertions Presented in MRJP3 (Major Royal Jelly Protein 3) Gene in Isfahan Persian Hony Bee (Apis Mellifera Meda)', International Journal of Advanced Biological and Biomedical Research, 2(Issue 4 (2)), pp. 57-70. Shahriar, M., Hatami, B., Eghbalsaied, S., Jalaliezand, A. A Survy on Deletion and Insertions Presented in MRJP3 (Major Royal Jelly Protein 3) Gene in Isfahan Persian Hony Bee (Apis Mellifera Meda). International Journal of Advanced Biological and Biomedical Research, 2014; 2(Issue 4 (2)): 57-70. Objectives: Royal jelly (RJ), a secretion of both the hypopharyngeal and mandibular glands of nurse workers, is believed to play a central role in honeybee queen development. Important component of royal jelly are proteins which form about 50% of the dry mass of RJ. Major royal jelly proteins (MRJPs) are the dominant proteinaceous component of royal jelly and constitute about 82-90% of total protein of royal jelly. One of these proteins is MRJP3(Major Royal Jelly Protein 3). that Intraperitoneal administration of AmMRJP3 inhibited the serum of immunized mice, indicating the clinical significance of the potent immunoregulatory effects of AmMRJP3. Nevertheless, So far No research has been done to identify the sequence of this gene in Iranian honey bee.The purpose of this study was to survey mutations in Sixth exon of mrjp3 gene in honey bee persion (Apis mellifera meda). Methods: On this basis, According to data from morphological variation of Apis mellifera meda, We chose nurse bees (< 10 days) from three colonies (Farm of Khorasgan University,Isfahan). were collected and stored at −80oC until needed. After studying gene, four primers were designed based on the OLIGO software information and NCBI site. Then DNA extraction and optimization of the reaction PCR, amplification products of MRJP3 gene were sequenced. Results: According to the results of the sequencing of the NCBI website and check with the software CLC Showed that the DNA and RNA sequences at Sixth exon be seen delesion and insersion in the persion honeybee (Apis mellifera meda) that different with European honeybee (Apis mellifera L.). Added area are from 3222-3281 that seen in persion bee but not seen in European honeybee. Delesion region in Apis mellifera meda is from 3366-3368 that there is in Apis mellifera L. . it appears that this results is common in Isfahani bees. In general, The results of this study indicate, Isfahan bees with European bees are different from MRJP3 gene sequence.